So, now that I crept you out with the above picture, I better explain myself. 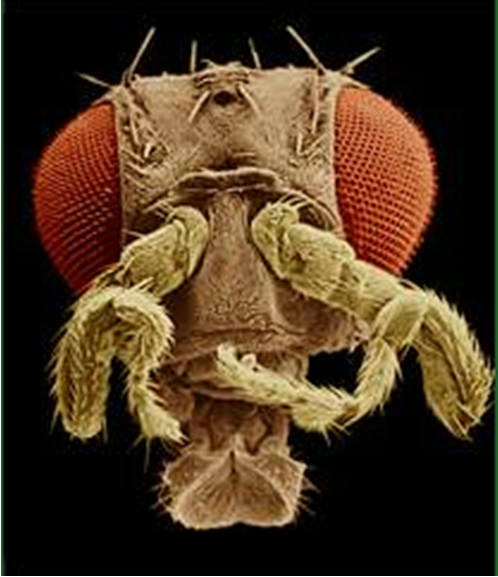 This fly pictured above is known as a Drosophila fly affected by the Antennapedia mutation in its genes. This leg-for-antennas mutation is actually quite simply caused and something that can make us awe at God because of His creation. The homeotic genes encode transcription factors that control the expression of genes responsible for particular anatomical structures, such as wings, legs, and antennae. The homeotic genes include a 180 nucleotide sequence called the homeobox, which is translated into a 60 amino acid domain, called the homeodomain. The homeodomain is involved in DNA binding, as shown in the images below (to the side>>). This all seems rather confusing but hold on for a minute as we will be explaining all this. First of all, we must understand that these homeotic genes are supposed to be in their certain part of the body. However, not all homeotic genes are model children and they occasionally get in the wrong part of the body during the embryonic stage. So, when the body calls for the homeotic leg genes to make legs, they will do it. However, if those genes have somehow made their way to the place where the antennas are supposed to be then . . . you have legs coming our your head. This is very unfortunate for the fly. But, interestingly enough, the fly is not the only creature with this problem. No, no, humans, plants and all kinds of other animals can have the same issue. Let’s see how it works in the animal department. Well, wanted to do animal homeotic mutants . . . but the only ones I can really find are on flies with legs growing our of their heads (sound familiar?) or with an extra pair of wings. So, I guess we will study how it can affect humans. Now, I found a very disturbing image of one of the most famous mutations in humans. I debated on whether or not to post it but, in the end, my stomach hardened and I decided to put it here. I hope it doesn’t turn your stomach. 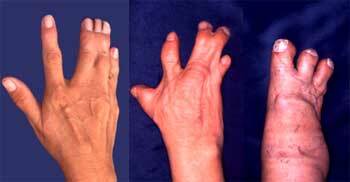 Anyway, this mutation is known as Synpolydactyly homeotic mutation and it affects the hands. What is really strange with this mutation is that it is actually due partway to the homeotic gene for making feet. This gene gets called on along with arm and hand gene and, while in the womb, the baby begins to form a hand-foot. This is usually made by the body producing an extra finger between digits three and four. When the extra finger is made the third and fourth one merge with the one in between. That makes mutations such as the ones featured in the picture to your left. Since you are probably sick (hopefully not literally) of reading and seeing homeotic mutations I will conclude with this quote from the University of Utah and a few words about it. Organisms can survive and reproduce even with homeotic gene mutations that produce differences in body shape. This means that homeotic mutations can be an effective means for evolutionary change. For example, in a mammal, a single homeotic mutation might produce an arm that is shorter, or longer, or broader. Regardless, it will probably still look and work like an arm. A change in body shape might lead to an advantage for an organism. For example, the mutation may allow it to capture food more effectively or be more attractive in some way. If this is the case, then the mutant organism may have greater reproductive fitness. Its genes may be preferentially passed along to the next generation, thus influencing the course of evolution. The University of Utah made a mistake with this one. Homeotic genes are harmful or useless mutations. Does it look like the Synpolydactyly homeotic mutation is going to help you out? I didn’t think so. Other mutations, such as the double wings, won’t change the fly into a bird or a frog. Let’s say an ape did have a homeotic mutation that made its arms shorter. For some reason let’s say those shorter arms are useful and the ape passes his genes on. If the next ape inherits the shorter arms that won’t make him anymore human or less-ape. He is still an ape. A little note: homeotic mutations usually don’t work out as well as my little one above. Homeotic mutations are quite amazing but they remind us of the fallen world we live in. I’m glad Jesus Christ is coming back.